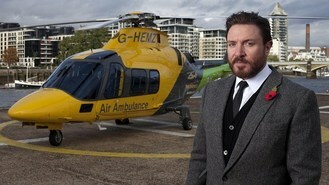 The Duran Duran singer was speaking in London at the launch of the Children's Air Ambulance, a new helicopter service dedicated to transporting critically ill children and babies. Simon said: "I had a bad experience about 25 years ago with a boat called Drum which lost its keel during the FastNet Race. I was rescued by the Royal Navy and their helicopter and diver. So I've experienced helicopter rescue first hand. The Children's Air Ambulance relies on charitable donations and needs to raise £545,000 before becoming operational next year.